Willis is a 1940's handmade caravan, permanently parked on a purpose built space with views over Tryphena harbour. 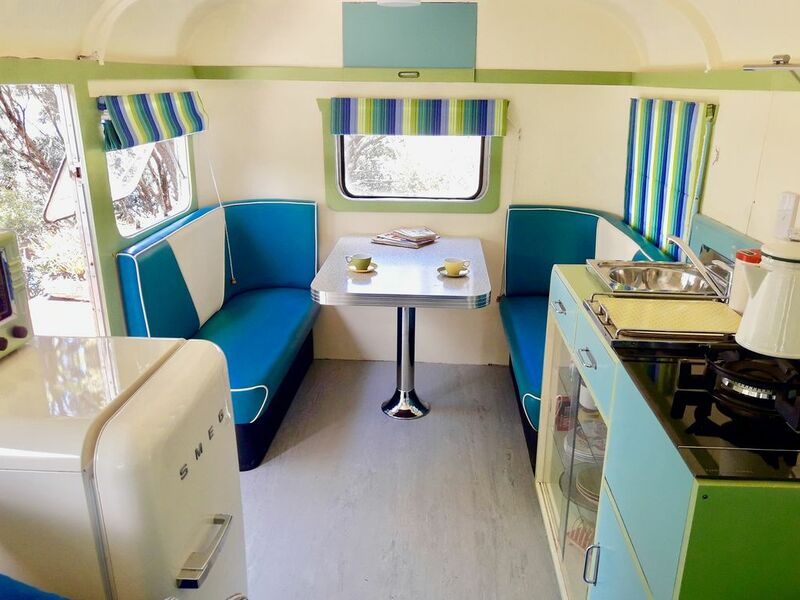 Fun and funky, Willis has been lovingly restored with a collection of retro kitchenware, a bluetooth compatible restored valve radio, a retro smeg fridge and classic American style booth seating. Located just a three minute drive from beautiful Gooseberry Flat Beach, shops, cafe, pub and Social Club. A relatively steep 500 metre 4 wheel drive access driveway will bring you to Willis. Car parking is an easy three minute walk from the caravan. Willis is named after her creater Arnie Willis who handcrafted her in his backyard in the 1940's Originally built of plywood she was reclad in aluminium later in life.